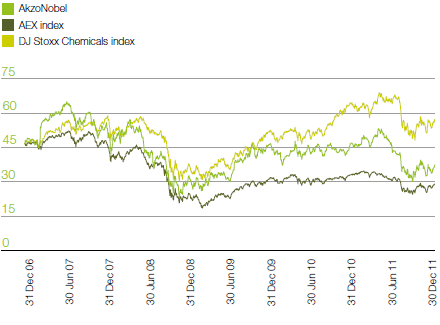 Our share price decreased 19.6 percent in 2011, underperforming both the DJ Stoxx Chemicals and AEX indices. The share price performance relative to these indices for a one-year and a five-year period is shown in the graphs. AkzoNobel’s common shares are listed on the stock exchange of Euronext Amsterdam. AkzoNobel is included in the AEX Index, which consists of the top 25 listed companies in the Netherlands, ranked on the basis of their turnover in the stock market and free float. 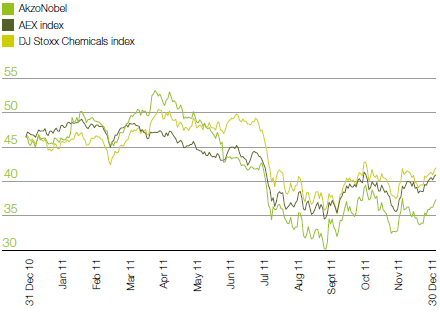 The AkzoNobel weight in the AEX index was 3.42 percent at year-end 2011. In 2011, 290 million AkzoNobel shares were traded on Euronext Amsterdam (2010: 311 million). AkzoNobel has a sponsored level 1 ADR program and ADRs can be traded on the international OTCQX platform in the US. The 3:1 ratio (ADR:ORD) became effective from January 2, 2012 onwards. For the sixth year in succession, AkzoNobel was included in the Dow Jones Sustainability World Index (DJSI World). We received particular recognition for our risk and crisis management, Code of Conduct, innovation management and environmental policy and management system. We were also again represented in the Carbon Disclosure Project, with an improved rating for transparency of reporting and performance. The Carbon Disclosure Project represents more than 500 institutional investors, with over $60 trillion in assets under management.